If you are stranded at Los Angeles International Airport (LAX) for more than a couple of hours or have a long layover with a craving for In-N-Out Burger, here’s how you can get your hands on an “animal style” Double-Double! Unfortunately LAX does not have an In-N-Out Burger at any of its terminals. 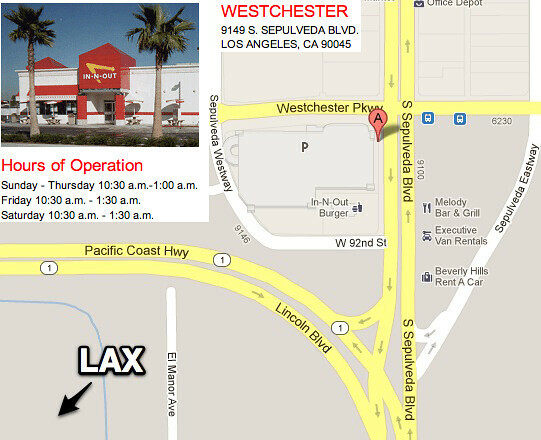 To satisfy your craving for that Double-Double, you will need to exit the LAX terminals and head to the nearest In-N-Out Burger in Westchester, which is Northeast of LAX (see map below). As you can see from the map, there is a parking structure right next to the In-N-Out Burger. The parking structure is a long term parking lot operated by The Parking Spot. The Parking Spot has shuttles that circles LAX terminals. You can catch the Parking Spot Shuttle on the middle island of the arrivals area. Hop on one of the free Parking Spot Sepulveda shuttles that will take you to the long term parking structure which is next to the In-N-Out Burger. Note that I have highlighted “Sepulveda” as the Parking Spot has another shuttle that goes to their “Century Boulevard” location. 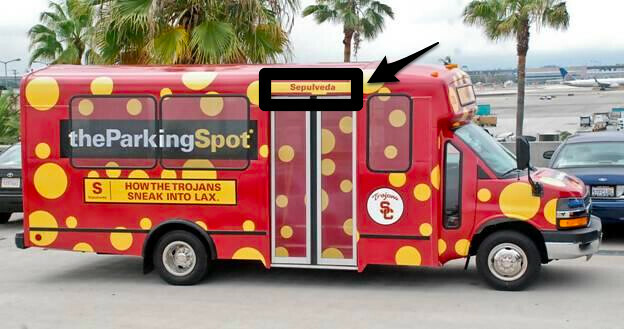 Make sure you get on the shuttle that has “Sepulveda” or an “S” at the end of the shuttle (see picture below). Even thought the In-N-Out Burger is less than a mile from LAX, make sure you give yourself enough time to get back to the terminals and pass through security so you don’t miss your flight! With heightened security measures at US airports, Los Angeles International’s (LAX) TSA staff can appear to be slower than usual over the 2009 holidays. But the situation isn’t all that bad. I got to LAX at 11:10AM for a 12:30PM flight in anticipation for delays and bag check. With Medallion status, it took me 50 minutes to check my bags and clear TSA security at LAX’s Terminal 5 for a Delta flight (I had to check a bag because I was carrying California wine back to the east coast.). * Give yourself at least one hour to get through TSA security regardless if your airline status. It still took me exactly 50 minutes to check my bags and get through TSA security; this is despite the fact that I’m a Medallion member, and I know my way around LAX terminals. * Forget the status line and just line up with everyone else. I was on the Delta Medallion/First Class line and waited 35 minutes to pass the first TSA security checkpoint – where they check your ID and ticket. The regular line was a lot faster as people who got in line with me passed me on the first checkpoint. There were 3 screeners checking IDs on the normal line vs 1 screener for the Medallion/First Class line. * If you’re checking bags and don’t have status, give yourself two hours to check your bags and get through TSA security. The regular bag check line was wrapping around the doors outside the departure terminal at LAX Terminal 5. I also noticed issues with the checkin kiosks as people were complaining. * Note that LAX’s Terminal 4, 5, 6, and 7 are all interconnected. You can always checkin at Terminal 5 and use the walkway to get to Terminal 7 or 4. I dropped off friends at LAX Terminal 6 and noticed the United line was also wrapped around the doors of Terminal 6 and terminal 7. I suggested our best practices (see previous posts: use Terminal 6 vs 7 and quickly get through Terminal 7) to my friends and they were able to clear TSA security in 20 minutes. All major airlines except Southwest are using domestic change fees to make up for lost revenue. United is notorious for imposing strict penalties on changes to your airline ticket. Below is an example of how they are doing it. 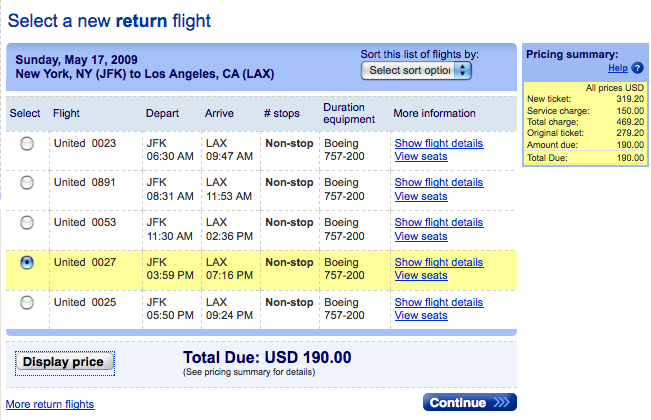 I will not be able to depart on my scheduled return flight from JFK to LAX on March 11, 2009. 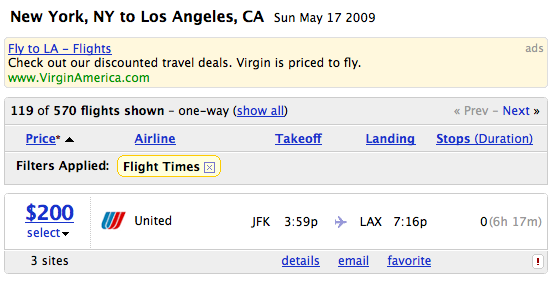 I went to United.com to modify my itinerary to change my return date from JFK to LAX to next Sunday, March 17, 2009. I noticed United has repriced my ticket to: $319 plus a $150 change fee making the new ticket $469. United then subtracted my original ticket of $279 and tells me I will need to pay $190 for the change. Below is a print screen directly from united.com. I then went to Kayak to see how much the one-way JFK to LAX ticket for the same flight with the exact same date and time is worth. The result (below) is $200. United is basically telling its customers that they are getting a $10 discount for making a change on a return flight vs buying a new one way ticket. United and other airlines should reward their customers for booking round trips with them. Booking a round trip used to be cheaper and customers were rewarded for being loyal. Under this circumstance, I do not see why I should be booking round trips with United or any airlines that charges a hefty change fee. I recalled back in 2005 when United would only charge you their change fee ($50 or so) and put you on the next available flight. Based on my current finding, I will cancel my United return flight on the very last minute to make sure United cannot sell my seat to another person. As long as you cancel before the flight takes off, United must issue you a credit. In the meantime, I will monitor Kayak and other sites for a cheaper return – I noticed American has a 9AM return on the same date for $180 which is a $10 saving. Taking advantage of customers through change fees should be reviewed by our Justice Department. Here’s a link to my previous post regarding airline change fees making your ticket under $200 worthless.